East 50, at newsstands and bookshops from the 1st of November in a slimmer format and featuring important new content, hosts Sergio Romano’s views on the bungled expulsion of the wife of Kazakh dissident Muxtar Ablyazov and Sandro Gozi’s take on the upcoming European elections while Franco Bernabè weighs the risks of an Internet smothered by crime and espionage. BBC correspondent David Willey analyses the impact of the “Pop Pope”, Jorge Mario Bergoglio, and Peter de Vrai presents the speech Queen Elizabeth II would have given to announce a Soviet nuclear attack on her country. 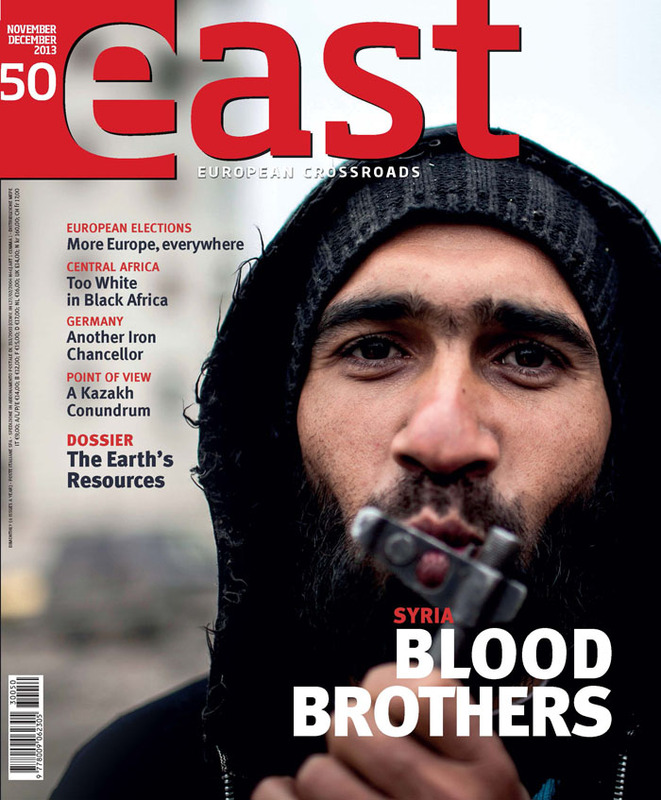 But that’s not all: get the inside story on the “blood brothers” of the Syrian civil war, Angela Merkel’s future prospects and the rising tension between Spain and the UK over Gibraltar; plus a rich dossier on Earth’s natural resources. James Hansen is EAST’s new editor-in-chief. A former diplomat in Italy since 1975, Hansen was Vice-Consul for the United States in Naples before moving to journalism as Rome correspondent for Britain’s Daily Telegraph and for the International Herald Tribune. He has since been Chief of Press for Olivetti, Fininvest and Telecom Italia. There’s a shopworn and overused Arab (or maybe Chinese, but that’s not the point) curse which says: May you live in interesting times That’s why it’s alarming to see how clearly this issue’s summary demonstrates that the times we live in are not ‘merely’ interesting; they are positively fascinating. The English banker, economist, philosopher, historian, author, publisher and journalist Walter Bagehot is not much remembered today – and to the degree that he is, it is usually (if wrongly) as the founder of The Economist. Buddhism is not associated with fundamentalism and violence, but they’re not immune. The weak always foot the bill. In the United Kingdom the worst hit by the endless economic and social crises are the young. South Africa faces its most difficult year since the end of Apartheid, as both its economy and soul hang in the balance. It’s over. Finally, the eurozone has exited the longest and worst recession since the Great Depression of the ’30s. But who should take the credit for ushering the 17-country bloc out of economic darkness? On a quest for a ‘pure’ gaze on the world, the Sensory Ethnography Laboratory at Harvard University has produced some of the most interesting documentaries in recent years. Mongolia still has a rapidly growing economy and an immense wealth of raw materials. However, its heavy dependence on China is creating tensions, as proven by the rise of neo-Nazi organisations fuelled by their hatred of Beijing. Israel, surrounded by the same enemies on which it depends for its energy supplies, has won a game-changing gamble that may re-deal the cards in the Middle East. The shortcomings of the West and its clothes, Indian feminism, the virtues of traditional agriculture, a repentant nuclear physicist explains what she means by “right” development. To pull itself out of the crisis, the Spanish capital has been seduced by the brainchild of controversial gambling magnate Sheldon Adelson: EuroVegas, a mega-casino that aims to bring the Nevada desert to the Old Continent. But cigarettes could send the project up in smoke. The Net’s happy ‘Woodstock’ years are over and risk being smothered in squalor and espionage. The Internet must “get a grip” or go under. The ISAF is gradually moving out of Afghanistan, which is now turning to its neighbouring Asian giants, with the Presidential elections on the horizon in 2014. Technical ministries seem to have replaced the historically strategic role of diplomacy and individual national foreign policies find little room for maneuver amid newly established global conventions. This Kazakh case appears to be an unfortunate product of this new distribution of roles. Recycling waste consumes less energy and fewer raw materials, as well as reducing greenhouse gas emissions. It also produces new goods that have a limited negative environmental impact, creating jobs and building a green economy: the only viable option if we want a more liveable world.